The depths of the underearth weigh heavily upon the party as they delve deeper into the cold, hard stone. Every river has an end, even those that never see the light of day. 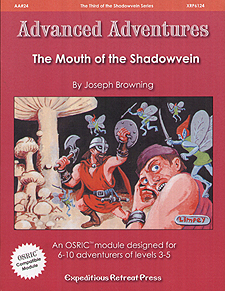 Many adventures behind, the party continues to find the mouth of the Shadowvein. What lies ahead is surely dangerous, but the lure of the deeps is strong with gold and magic. The Mouth of the Shadowvein concludes the exploration started in The Pod Caverns of the Sinister Shroom and continued in Down the Shadowvein. However, The Mouth of the Shadowvein can be played by those who have not explored those modules. This product uses the OSRIC System (Oldschool System Reference and Index Compilation).